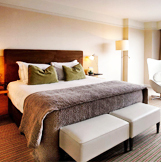 Depart San Francisco or Los Angeles airport for our overnight flight to Europe. Dinner and breakfast will be served on board. Welcome to Scotland! 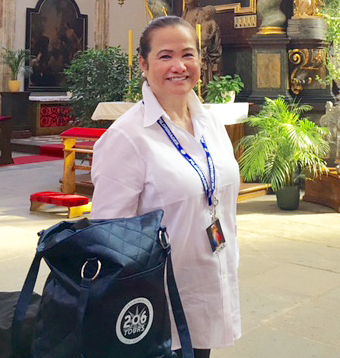 Upon arrival, we collect our luggage, meet our guide and driver, then Mass at the Cathedral of St Mary. Lunch is on our own, followed by a city tour. Stop at the UNESCO listed Palace of Holyroodhouse (with audio guide). The Palace of Holyroodhouse, the royal familyâ€™s official residence in Scotland, stands at the end of Edinburgh's Royal Mile. The Royal Apartments are where The Queen hosts State ceremonies. The Palace is best known as the home of Mary, Queen of Scots and was the setting for the most dramatic episodes in her reign, culminating in the murder of her secretary Rizzio. Next, we visit UNESCO listed Edinburgh Castle. This Castle stands upon the basalt core of an extinct volcano. It has been both a royal residence and a military stronghold. 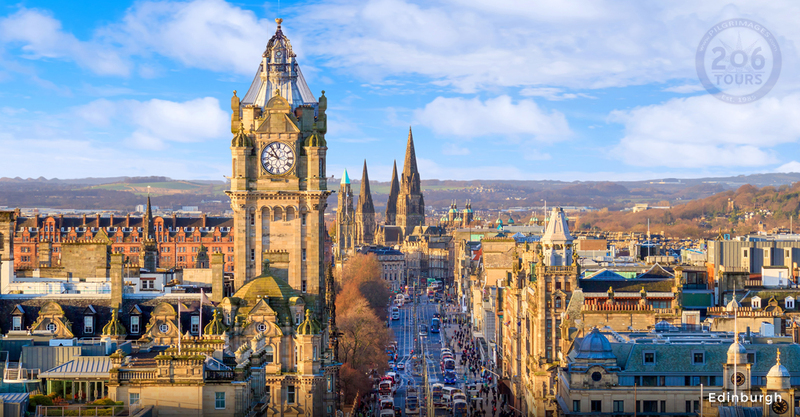 Visit the room where Mary, the tragic Queen of Scots gave birth to King James VI, admire Mons Meg - a giant 15th century siege gun and learn about the famous One Oâ€™clock Gun. On view are the Honors of Scotland â€“ the magnificent Crowned Scepter and the Sword of State which are the oldest Crown jewels in the British Isles. 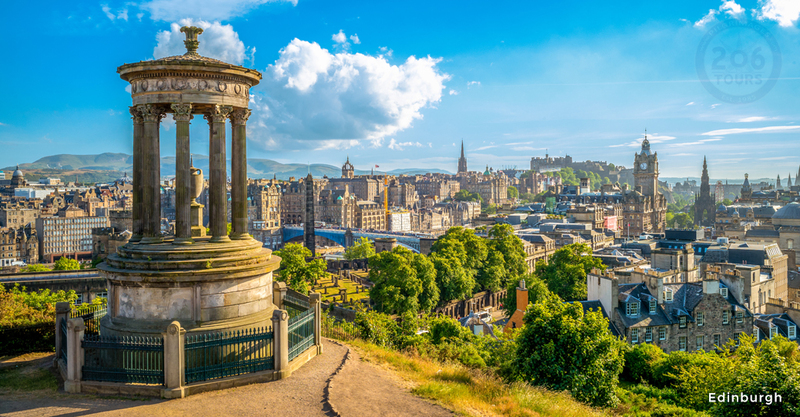 See the Stone of Destiny, the symbol of nationhood used to inaugurate monarchs of Scotland, England and the United Kingdom for over 1000 years. 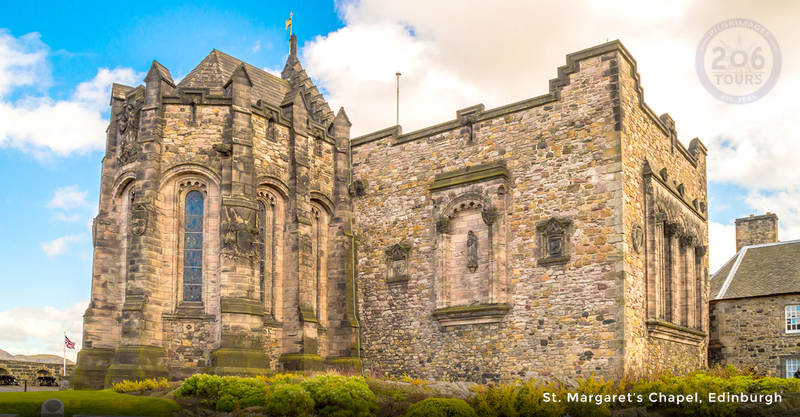 Visit the oldest standing building in Edinburgh, St. Margaret's Chapel, which withstood numerous destruction attempts. 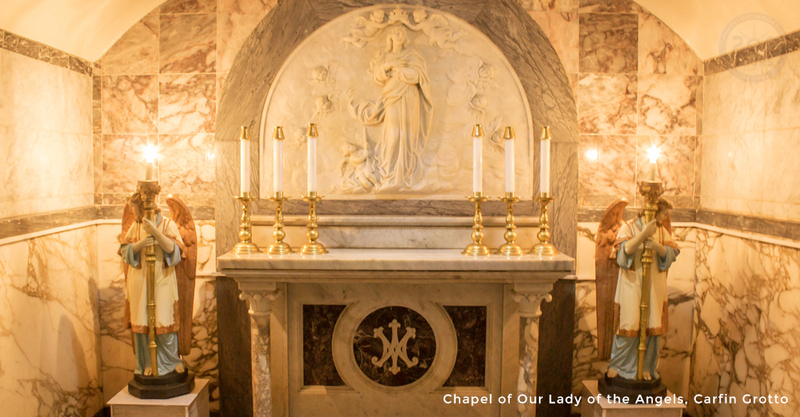 Dating back to the 12th century during the reign of King David I, he dedicated this Chapel to his mother, Queen Margaret, now Saint Margaret of Scotland. Then, check-in to our hotel. 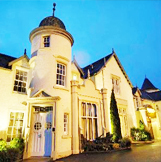 Final stop - Prestonfield House for: â€œTaste of Scotland â€“ Scottish Show and Dinnerâ€� â€“ a four course dinner with wine followed by a lavish show of traditional Scottish music, song and dance in a magical historic setting. Overnight at our hotel. 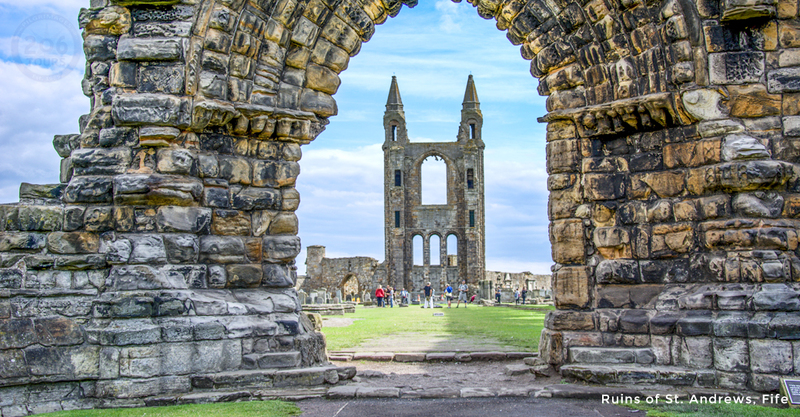 This morning, we travel to St. Andrews in Fife and visit St. Andrews Cathedral. 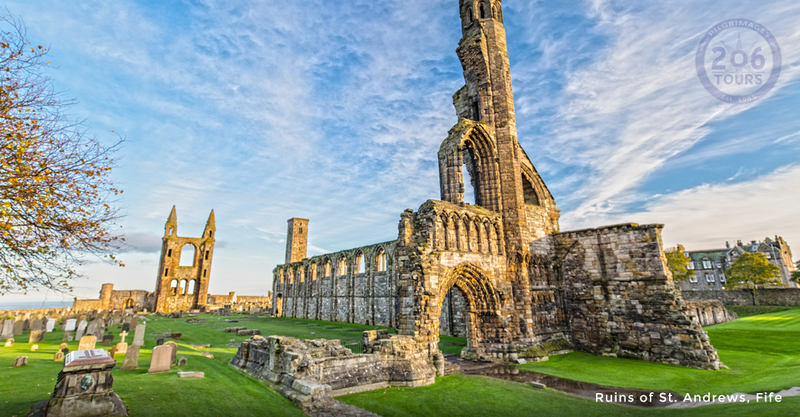 The ruins of what was Scotlandâ€™s largest and most magnificent church still show how impressive St Andrews Cathedral must have been in its prime. 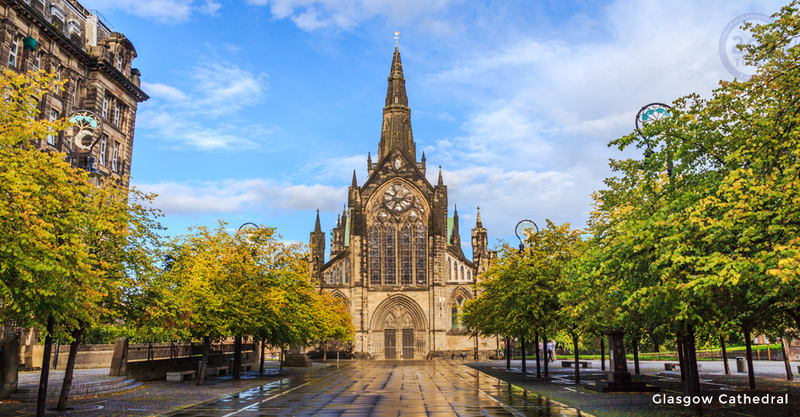 It dominated the history of the medieval Church in Scotland, from its construction in the 12th century until Calvinist zealots cleansed it during the Protestant Reformation in 1560. 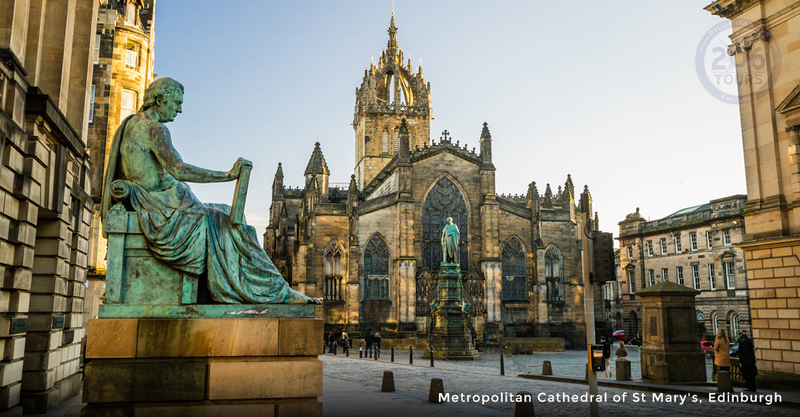 As Scotlandâ€™s largest medieval church, it was the seat of the country's leading bishops. Used for worship since the 8th century AD, when the relics of St Andrew, Scotlandâ€™s patron saint, are said to have been brought here, it became a pilgrimage Shrine for Christians. 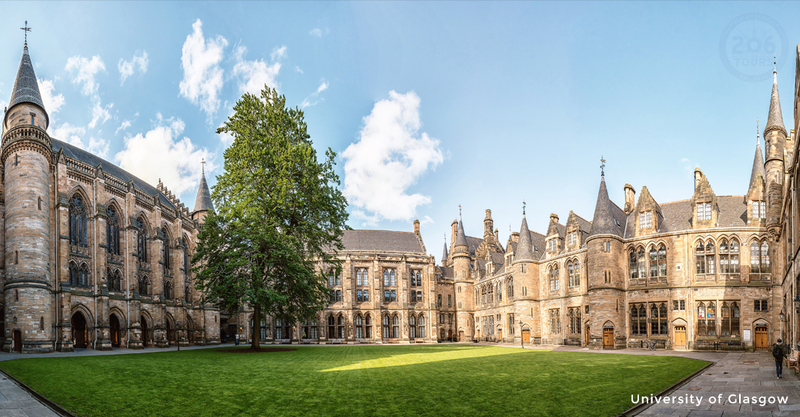 The cathedral buildings are surrounded by a graveyard and by the most imposing monastic enclosure walls in Scotland. The shape, in which St. Andrew was crucified, is a symbol on the Scottish national flag to remind the country of his martyrdom. Lunch at a local restaurant or pub. Then, a private Mass in St. Andrews. Return to Edinburgh. Enjoy free time. Meet for dinner. Overnight at the hotel. Following breakfast, we attend Mass. 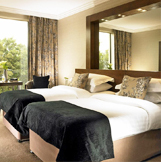 Transfer from Edinburgh to Pitlochry â€“ the gateway to the Highlands. Visit Blair Castle â€“ one of the most famous castles in Scotland which dates to 1269. It is also home to Europe's only legal private army, the Atholl Highlanders (the remnants of the old clan system when every clan had its own army). It is the seat of the Dukes and Earls of Atholl. Visit the castle. Enjoy a tour of 30 rooms, itâ€™s fascinating collections and beautiful gardens. As one of the first private homes to open to the public in Scotland, Blair Castle welcomes more visitors than any other. 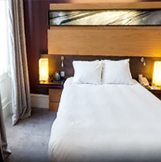 Then, transfer to Ballater â€“ with its rich history and world famous royal connections. Ballater is the nearest town to Balmoral Castle, one of the Royal Familyâ€™s residences and the Queenâ€™s favorite. This explains the many â€˜By Royal Appointmentâ€™ signs which can be seen on local shops and business. Lunch at a local restaurant. Tour Balmoral Castle. Balmoral has been with the British Royal Family since 1852, when the estate and its original castle were purchased privately by Prince Albert, consort to Queen Victoria. It is a private property of the royal family, not the property of the Crown. The Queen, The Duke of Edinburgh and The Prince of Wales take a close personal interest in running and improving the Estates. A mile away is the Royal Lochnagar Distillery which produces one of Scotlandâ€™s most exclusive whiskies. Enjoy a royal tour and tasting at the distillery. Then, we are off to Inverness. Dinner. Overnight at our hotel. After breakfast, private Mass at St. Maryâ€™s Church. Then, board a Jacobite Inspiration Loch Ness cruise. Loch Ness is a freshwater loch (lake) which is most famously known for its fabled Loch Ness Monster. Aside from its monstrous connection, this stunningly beautiful loch holds more water than Walesâ€™ and Englandâ€™sâ€™ lakes combined! While exploring Loch Ness above water by cruise, we can explore whatâ€™s under water via sonar on board. A safe and dry way to find Nessie! Our two hour cruise includes a visit to Urquhart Castle on the shore of Loch Ness. Once one of Scotlandâ€™s largest castles, Urquhart saw great conflict during its 500 years as a medieval fortress. Control of the castle passed back and forth between the Scots and English during the Wars of Independence. With power struggles, the Lords of the Isles regularly raided both castle and glen up until the 1500s. The last of the government troops garrisoned here during the Jacobite Risings blew up the castle when they left. Urquhartâ€™s ruins remain, offering glimpses into medieval times and the lives of its noble residents. Lunch on our own. Then, tour Culloden Battlefield, Clava Cairn, and Cawdor Castle. Culloden Battlefield - scene of the 1746 Battle of Culloden between the Jacobite and the British armies. As the last battle fought on British soil, Culloden marked the beginning of the dismantlement of the structures of Highland society. In its aftermath, kilts and tartans were banned. Find out why this battle lasted only one hour but still changed the course of Scotland's history. Continue to Clava Cairns - the site of an exceptionally well preserved group of prehistoric burial cairns that were built 4,000 years ago. The Bronze Age cemetery complex comprises of passage graves, ring cairns, kerb cairn and standing stones. Cawdor Castle dates from the late 14th century, built as a private fortress by the Thanes of Cawdor. The imposing, rectangular tower house consisted of four storeys and a garret with one entrance to the outside world set at upper first floor level - designed to keep out unwelcome visitors. 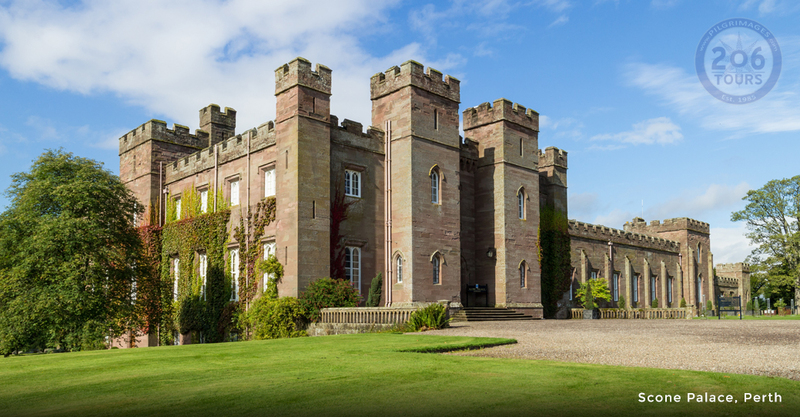 The ancient castle, still home to the Cawdor family, has evolved over 600 years and is filled with beautiful furniture, fine portraits, intriguing objects and amazing tapestries. Return to Inverness for dinner. Overnight at our hotel. Following breakfast, transfer to Glasgow. Scenic drive through the Highlands. Lunch at a local restaurant or pub. 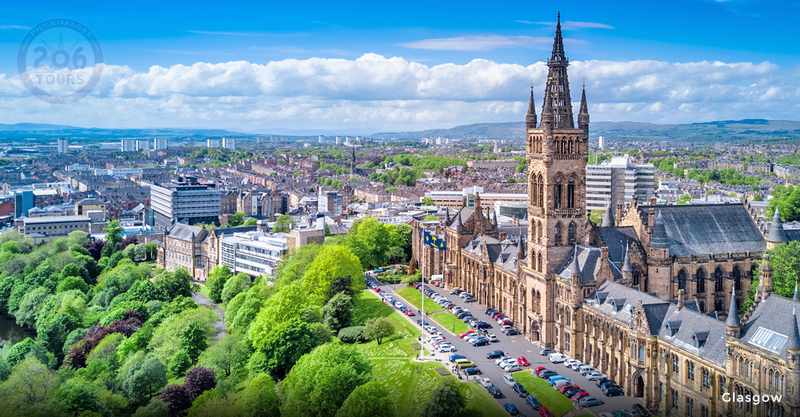 Upon arrival in Glasgow, enjoy a highlights city tour, with views of Tolbooth Steeple, Clyde Arc, Cineworld, and the University of Glasgow. 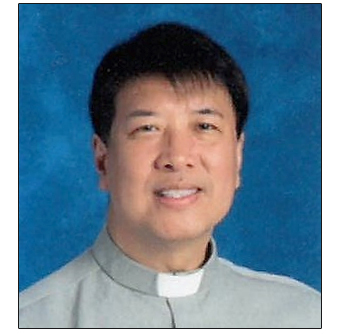 Visit St. Andrewâ€™s Cathedral for our private Mass. Then, free time. Gather for dinner. Overnight. After breakfast, transfer to the Glasgow Airport for our flight to Belfast. Upon arrival, we have a new coach, driver and guide. Private Mass at St. Malachyâ€™s church. Then, a half day sightseeing tour, with views of St. Anneâ€™s Cathedral, Queenâ€™s University, and Parliament House. Afterwards, we enter Titanic Belfast. Located in the heart of Belfast, it recreates the story of the worldâ€™s most famous ship in a six floor building right beside the historic site of the original shipâ€™s construction. Opened in April 2012 to coincide with the centenary of its launch, the self guided tour begins at the building's giant atrium, where one is surrounded by the four â€˜shipâ€™s hullâ€™ shaped wings. Walking through the nine large galleries of an interactive exhibition, uncover the story of the Titanic, from her conception in Belfast in the early 1900's, through her construction and launch, to her famous maiden voyage and subsequent place in history. Check in at our hotel. Dinner and overnight. Today, an early transfer from Belfast to Knock. 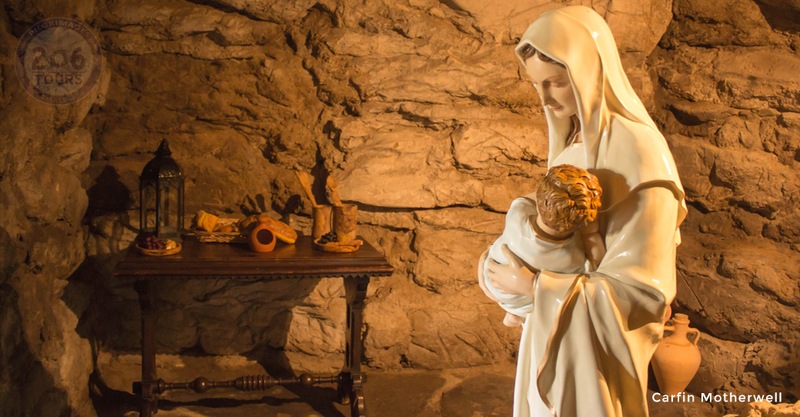 We will visit this shrine - one of the world's leading Marian shrines and pilgrimage destination - where on August 21, 1879 fifteen men, women and children witnessed an Apparition of Mary. 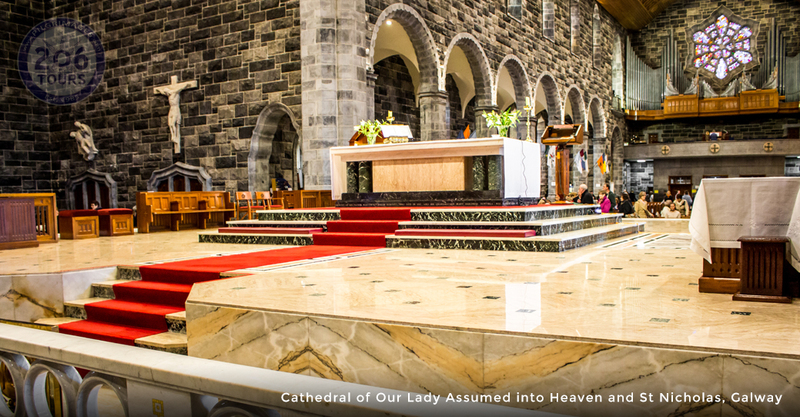 Visit the Basilica, the largest church in Ireland. In 1979 Saint John Paul II visited this holy place. After Mass, lunch on our own. Transfer to Galway. 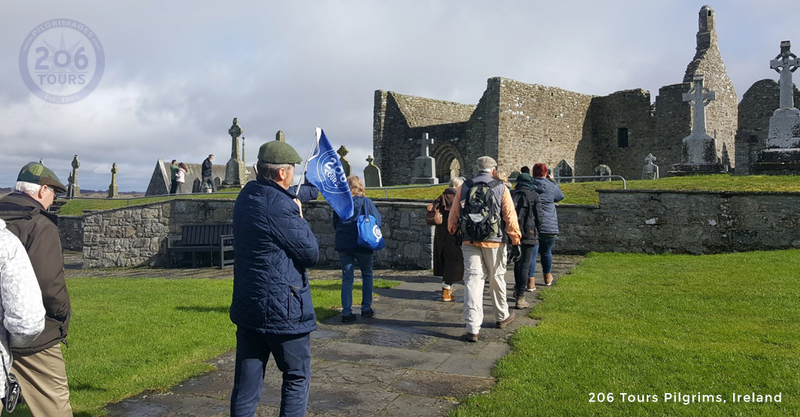 Sightseeing tour of Galway, including the Church of St. Nicholas. Dinner. Overnight. This morning, travel from Galway to Cork. En route stop at the Cliffs of Moher. 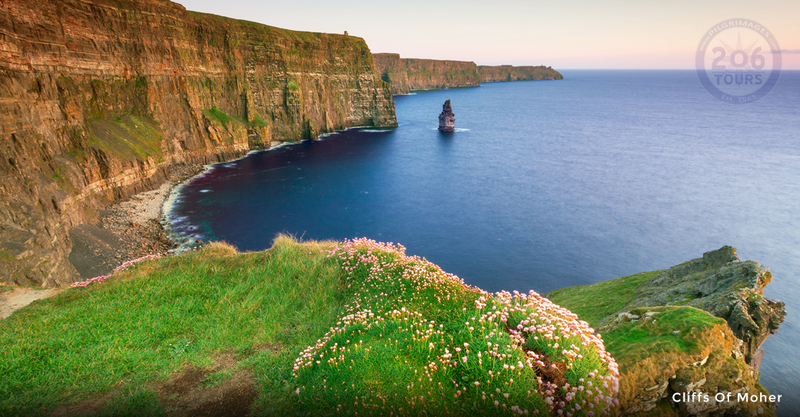 Situated on the Atlantic Ocean, the Cliffs of Moher are one of Ireland's most spectacular sights. Standing 230 meters above the ground at their highest point and 8km long, the Cliffs boast one of the most amazing views in Ireland. On a clear day, the Aran Islands are visible in Galway Bay as well as the valleys and hills of Connemara. The cliffs reach their highest point just north of O' Brien's Tower, built by Cornelius Oâ€™ Brien, a descendant of Brian Boru, to entertain his lady friends. The sweeping view across the Atlantic has recently been ranked the best 'cliff view' on the planet by Conde Nast Traveller. The publication has voted this world famous landmark #1 of ' Nine Gorgeous Cliff Views that rival The Grand Canyon'. Lunch on our own. Continue to Blarney Castle, which attracts visitors from all over the world. An ancient stronghold of the McCarthy's, Lords of Muskerry, it is one of Ireland's oldest and most historic castles. Built in 1446, Blarney Castle is famous for its Blarney stone, the Stone of Eloquence, which is traditionally believed to have the power to bestow the gift of eloquence on all those who kiss it. The Castle gardens - 60 acres of land â€“ include a water garden, fern garden and poison garden. Then, a highlights tour of Cork. Private Mass at Holy Trinity Church. Transfer to our hotel. Dinner. Overnight. 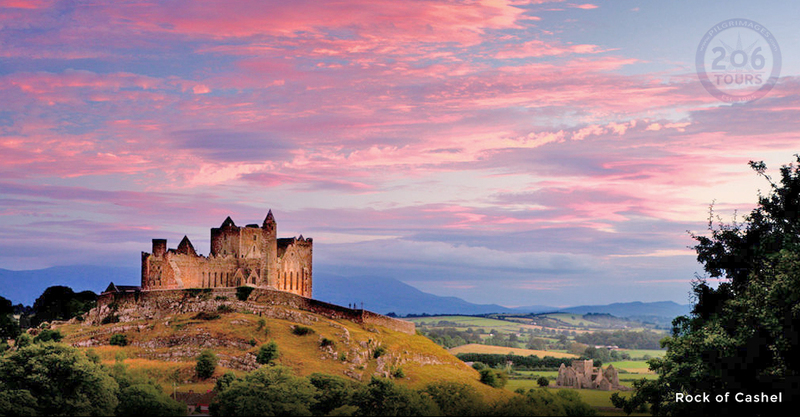 This morning, visit the Rock of Cashel. Possibly the most photographed site in Ireland, the Rock of Cashel towers over the town of Cashel from its perch on a 200 foot high outcrop of limestone. 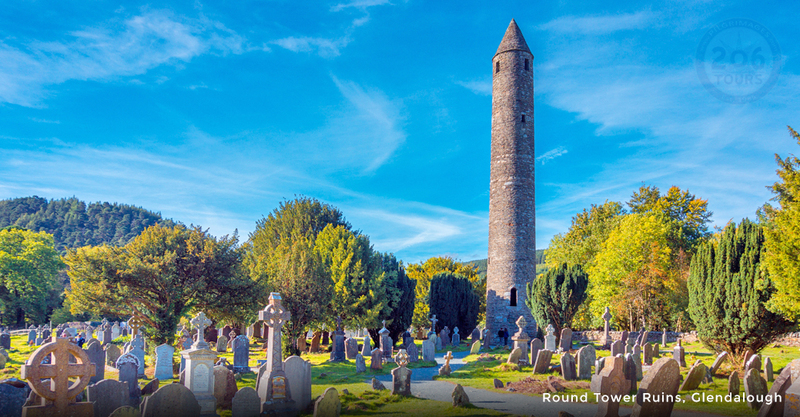 Once the seat of the Kings of Munster, St. Patrick visited the rock in 450 AD. Brian Boru was crowned the first high King of Ireland here in the tenth century. 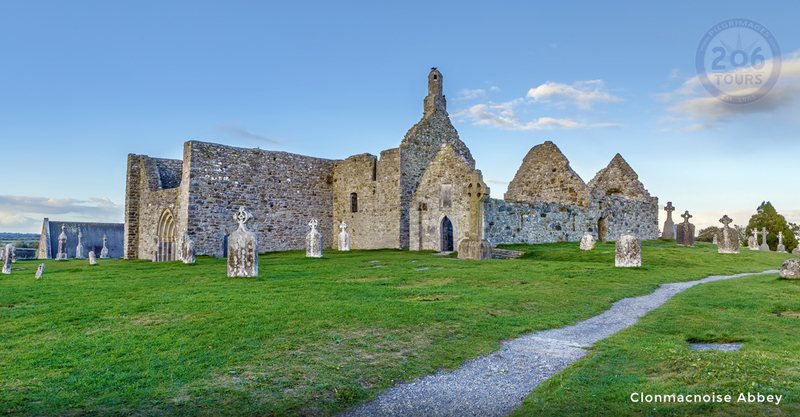 Granted to the church in the twelfth century, by the O'Brien clan, today the impressive stone walls enclose a round tower, a cathedral, a twelfth century Romanesque chapel and high crosses. 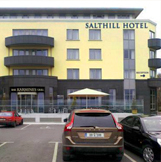 In 2011, it was visited by Queen Elizabeth II on her historic first visit to Ireland. Lunch at a local pub or restaurant. Then, visit the Holycross Abbey. 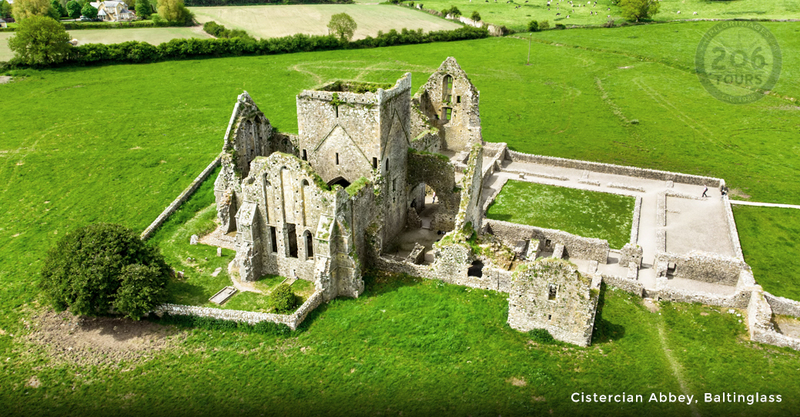 The picturesque Cistercian Holy Cross Abbey was built in 1168 by Donal Mor Oâ€™Brien for the Benedictine Order. The monastery was colonized by monks from Monasteranenagh. It was given the name Holy Cross as the monastery housed a portion of the true cross. This relic is now enshrined in the Abbey. 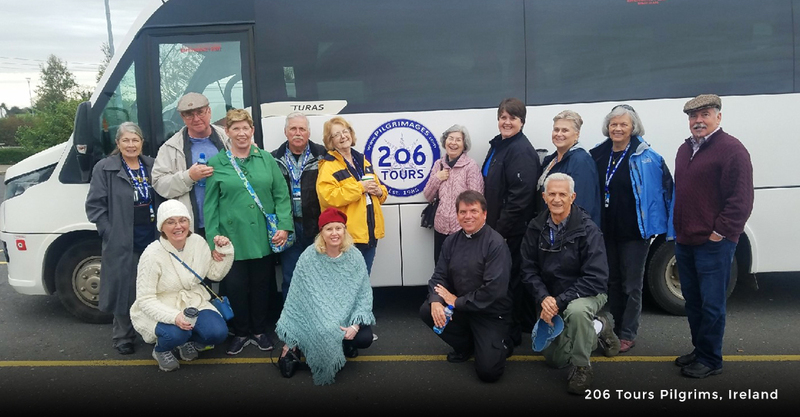 It became a place of pilgrimage among the Irish. Under the patronage of James Butler, the fourth Earl of Ormonde, much of the abbey was rebuilt in the 15th century, but after suppression, it was eventually left in ruins until the early 1970â€™s when a massive restoration project turned the Cistercian cloisters and chapels into a living church. The church has many interesting features including a variety of fascinating windows, mural paintings and many fine carvings. Return to Cork for private Mass, dinner and overnight. Today, we depart from Cork to Dublin. En route, we stop for lunch at a local pub or restaurant. Visit Glendalough. The English name Glendalough originated from the Irish â€œGleann DÃ¡ Lochaâ€�, which translates as "The valley of the two lakes". It was here that St. Kevin, son of the king of Leinster, founded a monastery in the 6th century. There are many legends concerning St. Kevin and he is often compared to St. Francis of Assisi. From a simple beginning the site grew to become famous as a center of learning throughout Europe. Standing for 600 years it was destroyed in 1398. Much of what is seen today dates from the 10th to the 12th century. One of the most attractive features is the 34m high round tower. A cathedral, stone churches and decorated crosses also survived albeit as ruins. Scenic walking trails take visitors on a circular route by the lakes. From Glendalough, we transfer to Enniskerry for a visit to Powerscourt Estate Gardens â€“ one of the most beautiful gardens in Ireland. It was recently voted No. 3 in the Worldâ€™s Top 10 Gardens by National Geographic. The Gardens stretch over 47 acres. It offers a blend of formal gardens, sweeping terraces, statues and ornamental lakes, secret hollows and rambling walks. From here, it is on to Dublin for Mass, dinner and overnight. 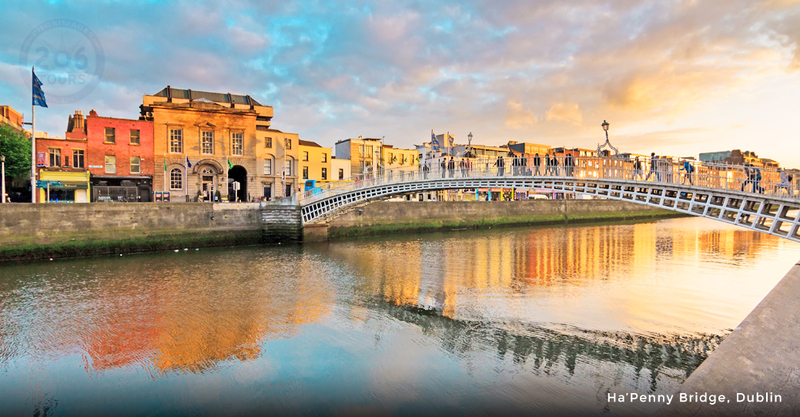 Today, enjoy a full day in Dublin - the capital of Ireland. Start with a private Mass at St. Maryâ€™s Pro Cathedral. Then, visit St. Patrickâ€™s Cathedral. 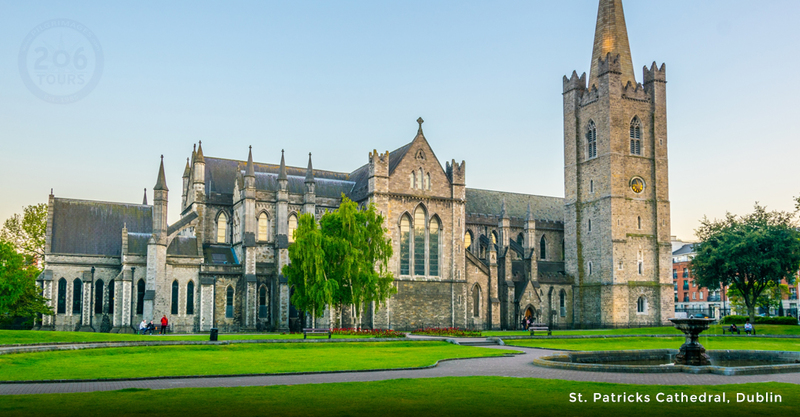 Built in honor of Irelandâ€™s patron saint, Saint Patrickâ€™s Cathedral stands adjacent to the famous well where tradition has it Saint Patrick baptized converts on his visit to Dublin. The present building dates from 1220. It is today the National Cathedral of the Church of Ireland (an Anglican Church). St Patrickâ€™s is Gothic in style and its interior is adorned with funeral monuments, such as, the grave of Dean Jonathan Swift (author of Gulliverâ€™s Travels). Swift was dean here until his death in 1745. The Chancel has ornate stained glass windows and spectacular choir stalls once used by the knights of St Patrick. The west towers house a large peal of bells whose ringing tones are so much a part of the character of Dublin. Lunch in a local pub or restaurant. Then, visit Trinity College & the Book of Kells. 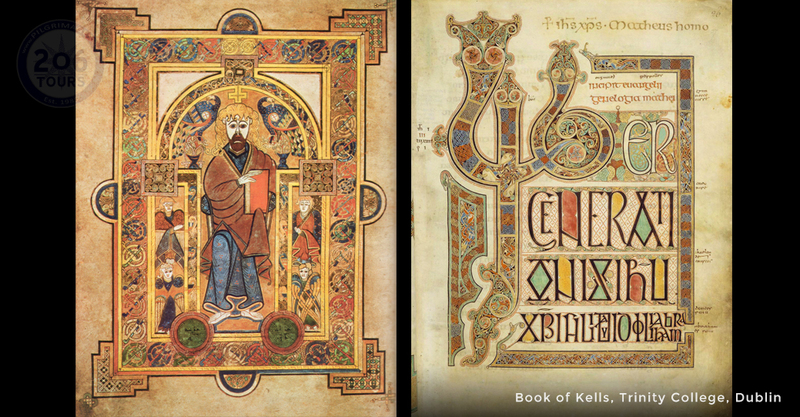 The Book of Kells contains the four Gospels in Latin based on the Vulgate text which St. Jerome completed in 384AD. The manuscript is known for the impact of its lavish decoration. Abstract dÃ©cor mixed with images of plant, animal and human ornamentation punctuate the text with the aim of glorifying Jesusâ€™ life and message. Trinity was founded in 1592 by Queen Elizabeth 1st on grounds confiscated from an Augustinian priory. It is the oldest university in Ireland. Built to further the education of the ruling Anglo Irish families, restrictions were imposed to prevent Catholics from attending courses. These restrictions were not fully lifted until the 1970â€™s. Trinity however admitted women in 1902, earlier than most British universities. Within its walls, visitors can admire Parliament Square and its 18th Century edifices. 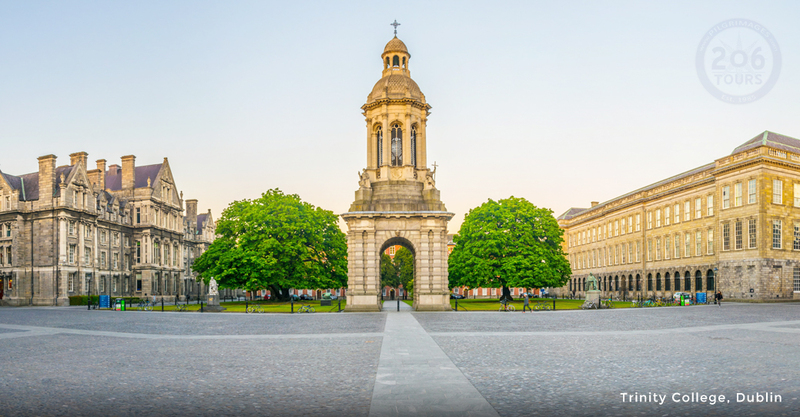 Trinity College had many famous students, such as Jonathan Swift and Samuel Beckett who later became a lecturer in French at the university. 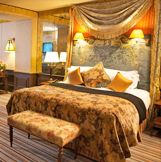 Our final night in Ireland will culminate in a three course traditional Irish dinner and â€œCeltic Nightsâ€� (traditional live Irish music and dancing show) at the Arlington Hotel. Afterwards, transfer to our hotel. After an early breakfast and heartfelt farewells, transfer to the Dublin Airport for our return flights home.